Windows are your eyes to the world. The right window treatment can take a room from drab to fabulous. 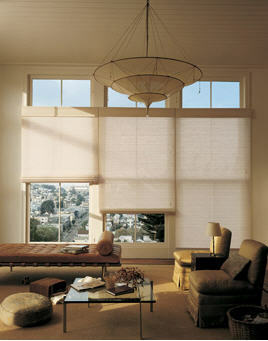 Window treatments can affect a room's lighting, its color, its temperature and even its mood. The window treatments you choose can establish your home's style, whether it is casual, formal or an eclectic mix. Wholesale Flooring Center offers a wide variety of light filtering shades, blinds and shading systems from Hunter Douglas. Since 1946, Hunter Douglas has led the industry in creating the highest quality, innovative window coverings for homeowners. Wholesale Flooring Center and Hunter Douglas are committed to offering you the the highest quality, custom-made window coverings. While providing solutions for everyday, practical needs - from privacy to safety to light control - while also satisfying your desires for a stylish furnishing that transforms your home.